Walking coast to coast across Scotland in just a day? Could such a route exist? Well, thanks to the wonderfully obscure geography of our misshapen land, one does indeed. It runs across the narrow neck of Scotland, from the south east tip of Loch Broom - a tidal sea loch - to Ardgay and Bonar Bridge at the top of the Dornoch Firth. The most direct route, through Gleann na Sguaib, Gleann Mor and Gleann Beag, is 33 miles in length, it's highest point a 2750 foot bealach beneath the summit of Beinn Dearg, a Munro. To do it in a day, particularly in October when we made our crossing, requires an early start - 7am for us. 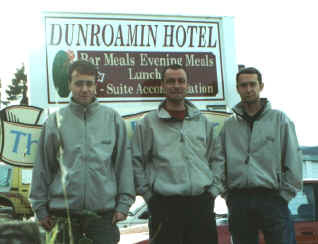 We'd spent the previous night in the SYHA hostel at Ullapool, rising at the distinctly ungodly hours of 5.30am. Sacks packed and boots on, we left our car at Inverlael, several miles south of Ullapool on the A835 and set off up the track from the roadside telephone box. The way skirts by a house and passes through a gate. A strip of reedy open ground leads to commercial forestry where the track rises through the trees. Ignore the first and second bridge on the left and continue to cross the third. From here, the forest road curves right and, half a mile on, arrives at a gate on the edge of the plantation. A good path climbs gently away from the trees through open Gleann na Squaib, the River Lael below to the right. The ascent is fairly steady and the path good. 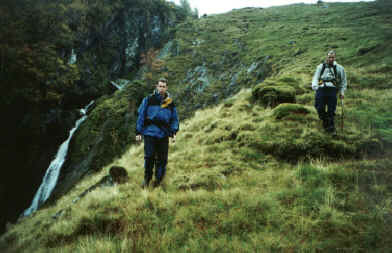 The glen itself is steep-sided and, higher up, a fairly spectacular waterfall is encountered. A short way beyond this, the path forks. Take the right-hand option and continue up into the coire. The way fords the stream, then re-crosses it again below a small unnamed lochan. On our visit we were accompanied by the constant braying of rutting stags and, with the mist low and conditions still, this created a rather eerie atmosphere. When the cloud did lift, it revealed dramatic craggy slopes above. The path zig-zags up over a boulder field to the col between Beinn Dearg and Meall nan Ceapraichean. A lochan occupies the pass. Here we took our first, much needed break of the day, hungrily devouring water, Mars Bars and mixed nuts. The path ends at the lochan and the next four miles or so to the bothy at Glenbeg are over rough, open ground. We descended north-east into the glen, picking up the burn that feeds Loch Tuath (pictured below right). The slope is strewn with rock and there are steep cliffs and giant black slabs to be avoided on the right. Lower down, we picked up a vague path leading towards the loch which sits in the shadow of high crags below Cnap Coire Loch Tuath. We skirted the south side of the loch and stayed with the burn as it led down towards Loch Prille. After wading across the mouth of the stream, a climb through heather and boulders took us north east up to the col between Cnap Coire Loch Tuath and Meallan nan Sac. More deer were spotted on the high ground as we embarked upon a leg-sapping trudge across a patchwork of soggy marsh and think, black peat bog. It seemed to go on forever, but finally we broke the back of it and joined the burn leading down to Glenbeg. The descent was steep, but our minds were taken off aching knees by spectacular views into a deep rocky gorge on the right, a high waterfall leaping over water-worn rocks (pictured top). The bothy, which is maintained by the Mountain Bothies Association, was a welcome site, a squat little stone cottage providing refuge from the inclement conditions. Once we'd fathomed out the rather unusual method of securing the front door, we tumbled in and sparked up our stove for lunch. Thanks to the Royal Marines, we were existing on military ration packs for the walk. Breakfast at Ullapool youth hostel had been a feast of burgers and beans. Lunch was a choice of Lancashire hotpot or chicken and pasta mush (their description, not ours), followed by chicken and sweetcorn soup and biscuits and cheese. Midway through our fine repast, we were visited by the owner of the estate on which we were passing through. He was out shooting deer with two companions and was interested to hear of our trek. After informing him we were sticking to the valley floor, he wished us well in our endeavour and headed off towards high ground. After cleaning up all traces of our visit, we shouldered our packs and headed out into the drizzle. The neighbouring burn was crossed and a vague grassy off-road vehicle track was picked up, running parallel to the Abhainn a'Ghlinne Bhig. Again, underfoot conditions were marshy for the next mile and a half until we reached a weir and bridge downstream. Here we joined an estate track and walked east through Gleann Beag, the solid underfoot terrain allowing us at last to pick up the pace. The next mile was easy walking, taking us quickly to another bridge over the widening stream. We opted against the path skirting below Meal Dionach and followed instead the track to Deanich Lodge, a neat two-storey cottage sitting in blissful isolation. Beyond this first sign of civilisation, the track crosses the river again before heading east in earnest, this time through Gleann Mor, a wider pass with no less steep flanks. 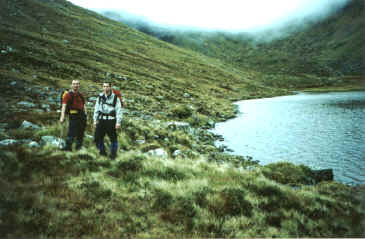 The trek was long and unrelenting but we kept the pace on to make up for time lost in the peat bogs above Glenbeg. The Abhainn a'Ghlinne Mhoir widens, slows and meanders along the base of the glen, running parallel with the track. The previously bare slopes above soon start to brighten up with patches of mixed woodland, but sadly our weather was not taking the hint and doing likewise. The route enters woodland in due course, a leg-pounding climb finally giving way to descent to the Alladale River, below Alladale Lodge. A bridge spans the water and, on the other side, we turned right and followed the increasingly turbulent river east towards Glencalvie Lodge. Above the lodge gates, the way crosses a cattlegrid, joining the public road on the otherside (pictured right). Here was an opportunity to pluck tired feet from soggy boots and don lightweight walking shoes for the final 10 miles of road walking to Ardgay and Bonar Bridge. The road skirts north, through woodland, and passes by the entrance to Amat Lodge where roaming gardens are heavy with shrubs, rhododendron particularly in evidence. Beyond the lodge gates, a junction complete with lone another telephone box is reached at The Craigs. The way to Bonar Bridge involves a right turn here. Daylight was still with us at this point but it was slowly fading. Some late sunshine had spun a rainbow out above Glencalvie Lodge, but this was fading fast and we knew it was only a matter of time before we were walking by torchlight. We put our heads down and plodded on. By the time we reached the bridge over the River Carron a mile further on, dusk was drawing its dark curtain over us and we realised any significant rest stops would probably lead to our legs seizing up. We strode on, gently, at first unknowingly, slipping on to auto-pilot as our legs started to eat up more and more of our dwindling energy resources. By Braelangwell Lodge, the head torches were out and on and a quick bite of Kendal Mint Cake saw us swiftly on our way again. Now completely engulfed by the night, cloud masking any trace of the moon, we left the map firmly packed away and trudged on, our next main point of reference the road bridge over the River Carron at Cornhill. The walking went on and on, three increasingly tired hikers waiting anxiously for a road sign that would herald its arrival. But all we encountered were passing place boards, one after the next, followed by another, and then another. Like a blunt axe, each one took a small chip out of our gently fraying nerves. Finally, the thing we wanted to see emerged from the gloom, the very welcome message: 'Ardgay 1'. An audible cry ripped through the night sky and, spirits lifted, we almost cantered the single mile into Ardgay (pronounced Ardguy), a small village perched on the south-west tip of the Dornoch Firth. From here, the final flat mile crosses a level plain of alluvial deposit between the firth and the Kyle of Sutherland. A plain metal span signals the arrival of Bonar Bridge, Highland outpost and journey's end. So we'd done it. 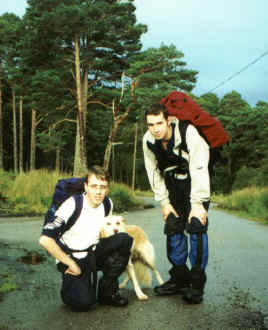 Walked coast to coast across Scotland in a day. Our immediate thoughts? Well, nothing more than the desire for a couple of pints and a comfy bed for the night. We booked rooms at The Trading Post Hotel and retired to the lounge of the aptly named Dunroamin Hotel (pictured right, the following morning) where a pleasant and very convivial Saturday night was spent, locals interested in our endeavours, we in the contents of the barrels beneath their bar. WALK FACTS - Distance: 33 miles/53km. Maps: OS Landranger 1:50,000 sheets 20 and 21. Start: Phone box at Inverlael, on the A835, eight miles south of Ullapool (grid ref 180861). Finish: Bonar Bridge (grid ref 610915). Parking: Some space at the old road bridge, 200 yards north of starting point. The best way to do this route is either to have someone drop you off at the start and pick you up at the end, or leave a car at both ends. Grading: A long and arduous trek through remote, isolated and uninhabited glens. There is path and track in the main, with the exception of the stretch between the Beinn Dearg col and the bridge a mile and a half east of Glenbeg Bothy, which is over very rough ground. The only open public shelter on the route is Glenbeg Bothy (grid ref 313835). Accommodation: The nearest SYHA hostels are at Ullapool and Carbisdale Castle. There are hotels, B&Bs and a campsite in Ullapool and hotels and B&Bs in Bonar Bridge. We stayed at the Trading Post (£17.50 per person with full English breakfast).